From the very beginning of the Spiritualist movement, there were magicians and skeptics who were adept at re-creating the allegedly "miraculous" phenomena of the mediums. They would do so by duplicating, then exposing, their effects. The methods practiced by the mediums were simple, these men claimed, and were merely stage illusions just like the ones being created before audiences in vaudeville theaters across the country. "If I can only get your attention intently," one magician claimed, "an elephant could pass behind me and you would not see it." "Is Spiritualism a fraud? Are the spirit-rappings and the spirit-forms of the séance, the prophecies of the palmist and the clairvoyant, the visions of the trance mediums, genuine evidence of a spirit-world, or are they mere catchpenny tricks, engineered by charlatans to charm money from the pockets of the credulous?" These were questions asked by Pearson’s Magazine in March 1910, when it began a series of articles written by William S. Marriott about Spiritualism. The editors added that "in order that readers of Pearson's Magazine may judge for themselves the pros and cons of this tremendously important subject. If Spiritualism is genuine, it ought to be a vital factor in the lives of us all: if false, then it and its high priests should be ruthlessly exposed and believers in it disillusioned of a faith that is altogether vain." Unfortunately, little is known about Marriott’s early years, how he got started in the magic field and what led him to pursue the truth behind Spiritualist mediums. What we do know is that he was described as a likable man with “a pair of well-waxed mustaches” and that he was a British professional magician who performed under the name of Dr. Wilmar. At some point, in the early 1900s, he became interested in exposing the hoaxes that were being carried out by fraudulent mediums. He actually took up this task before magicians like Houdini, who became quite famous for it. One of his first, and most valuable, exposures came when he located and publicized a copy of a catalog called “Gambols with Ghosts: Mind Reading, Spiritualistic Effects, Mental and Psychical Phenomena and Horoscopy”. It was a secret catalog that was being circulated among mediums and was filled with tricks, apparatus and paraphernalia that could be used to dupe the public. The catalog was issued in 1901 by Ralph E. Sylvestre of Chicago and was designed for private circulation among mediums, on the understanding that it would be returned to Sylvestre when tricks had been selected from it. The catalog, a copy of which was later obtained by Harry Price and added to his library, had an introduction to it that read: "Our experience during the past 30 years in supplying mediums and others with the peculiar effects in this line enable us to place before you only those which are practical and of use, nothing that you have to experiment with. We wish you to thoroughly appreciate that, while we do not, for obvious reasons, mention the names of our clients and their work (they being kept in strict confidence, the same as a physician treats his patients), we can furnish you with the explanation and, where necessary, the material for the production of any known public 'tests' or 'phenomena' not mentioned in this, our latest list. You are aware that our effects are being used by nearly all prominent mediums of the entire world." This notorious catalog included equipment for slate-writing, stuffed ghosts, self-playing guitars, self-rapping tables, materializations, and a "Complete Spiritualistic Séance." Marriott obtained a number of these illusions from the catalog and had himself photographed posing with them. Marriott had become disenchanted with the deceptions being carried out by dishonest mediums. As has been pointed out many times already, Spiritualism was riddled with cases of outright fraud. Many deceptive mediums would do whatever they could to bilk unsuspecting clients and sitters out of money to "contact their deceased loved ones.” And while not every medium was dishonest, there were enough of them to color the entire movement -- and to give Spiritualism a bad name. One of the most thrilling aspects of any séance was the materialization of the spirits. Some mediums, like Florence Cook, built an entire career on such materializations. Because the appearance of the spirits was so important to a good séance, fraudulent mediums would do just about anything to cause it to happen -- from smoke to mirrors to even more dishonest shenanigans. As the heyday of the Spiritualist movement began to wind down, the fraudulent mediums became more and more sloppy with their tricks and manipulations. Gone were the days of elaborate stages shows like those that had been created by Pepper and in their places were cheap displays and shoddy hoaxes. A case that illustrates this point was reported in newspapers in 1906. As it turned out, two ardent and legitimate Spiritualists were responsible for exposing the fraud. These men went to an apartment where a séance was to be conducted and became suspicious of the chair and the cabinet used by the medium. They managed to examine the chair and found a secret compartment in the rear and also a keyhole, which was carefully concealed beneath the upholstered material that covered the rest of the chair. The investigators then had a key made, which would open the lock, and found another secret compartment that was 15 inches deep. At the next séance, the men noticed that the back of the chair seemed to be stuffed much better than the rest of it and suspected that "ghostly" materials had been placed there before the sitters arrived. During the séance that followed, the men were not surprised to see that all manner of "ghosts" materialized and when it was over, they exposed the medium as a fraud. They opened the secret compartment on the chair with their own key and began removing the items contained inside. They found a collapsible dummy head made of pink material; a flesh colored mask; six pieces of china silk that comprised about 13 yards of material; two pieces of black cloth; three beards and two wigs of various color and length; a telescoping rod from which drapery could be hung to represent a second ghost; a small flashlight with four yards of wire and a switch, which would be useful to make "spirit lights" and various other contraptions. Exposures like this one prompted Marriott to begin his own investigations and he soon made a name for himself --- and a number of enemies among the frauds of the Spiritualist movement. This should have closed the séance. Tonight, an unrehearsed effect was in store for the believers. As the form entered the cabinet, he sat down on what he thought was the settee. It happened to be my knees. I had quickly slipped into the curtained enclosure and was sitting, waiting for him to come back. As my arms went around him, he gave a yell followed by language which I will not repeat. My friend had the light up in a moment. And there for the faithful was the edifying sight of the medium, clothed in flimsy white draperies, struggling in the arms of myself! Marriott’s reputation as an investigator was widely known. He was a friend of Harry Price and through him, acquainted with Everard Feilding, who was intensely interested in psychical phenomena. Feilding frequently held séances at his home with notable mediums and Marriott was often called in to “vet” the phenomena --- often with amusing results. On one occasion, Feilding invited a German apport medium to London. The medium specialized in causing fish, flesh and fowl to appear in the séance room and often worked in semi-darkness. Feilding invited him to dinner one night and it was arranged that a séance would be held after the meal, to which Marriott was also invited. The medium arrived very early --- but so did Marriott. Both had the run of the home for a considerable time before dinner was ready to be served. Shortly before the meal was announced, the medium was placed in another part of the house while Feilding and Marriott thoroughly examined the dining room. They made a curious --- although not completely unexpected --- discovery. Carefully hidden in the folds and frame of a silk lampshade that was suspended above the table, they found a dozen large boiled prawns! A slight jerk of the shade caused the prawns to fall onto the table. The men replaced them in their original positions after they had made a few “adjustments” to them. After dinner, the table was cleared, and a discussion took place about the séance to follow over as dessert and coffee was served. It was agreed that the sitting should be held around the dining room table --- an arrangement the medium heartily endorsed. Most of the lights were put out and the séance began. In a few minutes, the medium was in a deep trance, which was marked by his rapid breathing and waving arms. Suddenly, a shower of something fell onto the guests. All of the lights were turned on and it was discovered that a “miraculous” fall of prawns had taken place. They had seemingly fallen from nowhere. But what astonished everyone even more was that each of the prawns had a red band of silk tied in a bow around it! One has to wonder what the medium was thinking when this occurred but according to Marriott, he had a good laugh at himself. The magician had come to the house with a reel of red silk, hoping to make good use of it, but he had not anticipated prawns. He later presented one of them to Harry Price for his museum of such objects. Marriott photographed a number of experiments for Pearson's Magazine. In this photo, he showed how small tables could be easily levitated with nothing more than his foot -- which was virtually undetectable in a dark room. Marriott, along with Harry Price, was also involved in the controversy concerning the Crewe Circle and alleged spirit photographer, William Hope. The incident in which Price exposed Hope as a fraud was described earlier in the book but Marriott had his own brush with Hope and the Crewe Circle. In 1921, a journalist named James Douglas, had a photograph take of himself by William Hope that, when developed, showed the presence of a spirit extra. Douglas was so impressed with the image that he issued a public challenge to anyone who could duplicate the feat without using psychic powers. Marriott accepted the challenge and performed not only in front of Douglas, but also in front of Everard Feilding and Sir Arthur Conan Doyle. 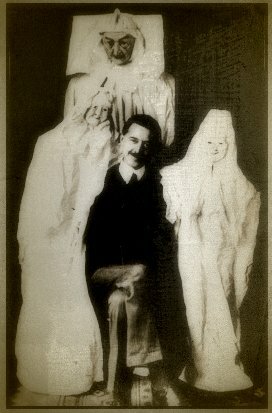 He produced a photo of Douglas and Conan Doyle with a young woman who seemed to be a ghost and a picture of Doyle with little fairies dancing in front of him. He then explained in detail how he had created them. Sir Arthur was so impressed by the quality of his work, and Marriott’s honesty, that he felt compelled to make a public statement: "Mr. Marriott has clearly proved one point, which is that a trained conjurer can, under the close inspection of three pairs of critical eyes, put a false image upon a plate. We must unreservedly admit it." Marriott had not demonstrated that Hope was a fraud but he had show that what some believers thought was impossible by ordinary means could actually be accomplished by a skilled magician. Marriott was so well respected by “both sides of the aisle” because he was not just offering money to anyone who could perform a paranormal feat he could not duplicate. Rather, he was simply showing that alternative explanations to apparent miracles existed and he was invited open-minded observes to decide for themselves what they wanted to believe.